Today, I’m showing you how to take five recipes from The Pretty Dish and turn them into meals and snacks for the week! I rarely make full blown meals for prep, but sometimes it’s just necessary depending on our schedule. Eddie actually does prep all of his lunches for work on Sundays and we always make a bunch of smoothie packs to have on hand. I tend to do a few small things (always overnight oats and/or chia pudding, maybe a soup) but nothing that makes the entire week work smoothly. But this! This is, like, full blown prep for actual meals, snacks – even syrup for coffee! We have a chili, granola bars, pesto (that can be used for so many things), syrup for coffee, chickpeas and bases for salads and sides. 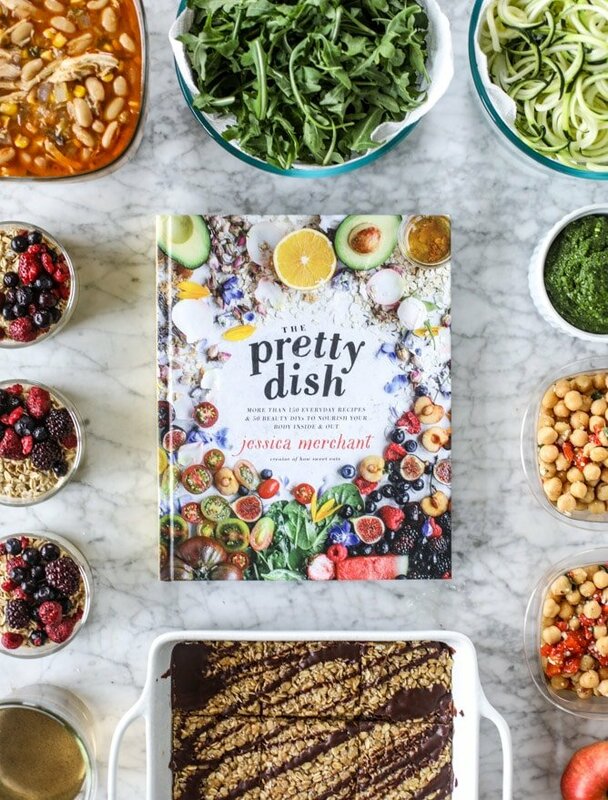 I was so inspired because many of you (especially in The Pretty Dish book club!) have been making enough food to prep for the week from the book. So if you like this idea, I may turn it into a semi-regular series! The recipes we’re using today are: Lavender Vanilla Syrup, Maple Raspberry Overnight Oats, Tahini Granola Bars, Roasted Corn Chicken Chili, Poblano Pesto Zoodles and Marinated Chickpeas. I find that this is actually a super balanced and reasonable amount of food to prep. It allows a little room for eating out, take out, changing your mind, etc. And extras can always be frozen, so that’s amazing. To really maximize your time, I suggest having everything bought the night before, starting with a clean kitchen, sink and dishwasher, and then moving nonstop for the hour and 15 minutes! Here’s how you can make it happen in 75 minutes! Quickly char the poblano peppers for the pesto. They have to steam for a bit, so do it first! Time: 5 minutes. Make the Lavender Vanilla Syrup so it can cool completely while you prep everything else. Time: 5 minutes. Make the Roasted Corn Chicken Chili. I used a rotisserie chicken because I had it on hand and still used all the spices. I didn’t add the sour cream or cheese at the end, since I was prepping it ahead of time. I’ll add it on top and inside as we go! This only took me 15 minutes to throw together. Let it simmer for a bit while prepping everything else to really up the depth of flavor. Time: 20 minutes. Make the Tahini Granola Bars. These come together super quickly, but have to chill in the fridge for a bit before you cut them. Time: 15 minutes. Make the Poblano Pesto. Whip everything up together in the food processor and boom, you’re done! Time: 10 minutes. 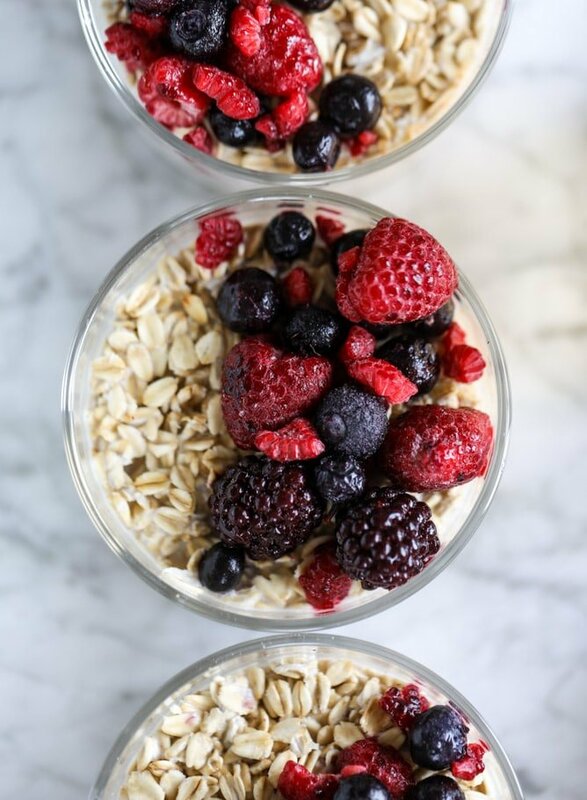 Make the Maple Raspberry Overnight Oats. I have found that overnight oats only really last me three days. I don’t like to make them any further ahead. This also allows for variety in breakfast- or I’ll take five more minutes on Wednesday night and make a few more. I added frozen berries to the top and put a lid on them! Time: 5 minutes. Make the Marinated Chickpeas. A little chopping and stirring – that’s about it! Time: 10 minutes. Spiralize you zucchini (it will last about 3 days in the fridge with a paper towel) and prep some arugula or lettuce for salads. Place them in a container lined with a paper towel and they stay great! Time: 5 minutes. As I go, I put everything in the containers they will live in while I’m making said dish. The only thing I wait on is the chili and the granola bars. So at this point, all I have to do is package up the soup and cut and wrap up the bars! And it should be noted here that if you feel like it’s too much or realize after a day or two you won’t use it up, you can always freeze (all, or half of) the chili, pesto and granola bars easily. And here’s how to utilize the dishes: aside from just eating them! Lavender Vanilla Syrup: iced coffee, lattes and cocktails, of course! Marinated Chickpeas: serve on a salad, serve on a wrap, serve as a side dish or eat them right out of the jar as a snack! Zucchini Noodles: use them in the Poblano Pesto recipe, use them as the base for a salad or even add them to the chili for extra veg. Arugula: make a simple salad with parmesan, use as a base for the chickpeas, add to omelets, stir into the soup. I’d love to know if (and what!) you’ve been prepping from The Pretty Dish. I love that we have a stocked fridge now and it’s all full of stuff I love so much! P.S. if you don’t have your book yet, grab a copy here! I love this idea and would love to see it as a regular series! I’ve recently started doing meal prep and I love the tips you gave for the pretty dish! Love you book. Currently having the blood orange ricotta toast for breakfast as I type this! I’ve been prepping the Zucchini Bread Pancakes; just make and freeze. They reheat beautifully and taste amazing! I’ve also been freezing the Barbecue Bourbon Burgers (the patties) and making the caramelized onions in advance and refrigerating. Super easy to go from freezer to grill and warm the onions for a topping. This has been my most-used cookbook so far (and I have hundreds!). Excellent work! love those ideas! thank you! This is so helpful! Thanks for the meal prep tips! I somehow just discovered your site a few weeks ago and since then have bought both your cookbooks! I absolutely love your recipes. As a school librarian, meal prep is an essential part of my week to ensure I eat healthy, so I would love to see more meal prep posts! Thank you! thank you so so much emily! I HAVE to meal prep on weekends to survive my week. Otherwise I eat junk that I shouldn’t eat and all my training goes out the window. I would love it if you do a series! I did a long training run this morning (training for an ultra marathon) and got home and napped. Just woke up STARVING and am eating a baked potato topped with your pulled pork from Seriously Delish, some avocado and pickled red onions from your blog (which I put on everything). I threw it all together in less than five minutes which is a huge saviour – otherwise I’d be eating cheese sliced off the block or something. So sometimes I just prep random ingredients and then they come together randomly throughout the week. I think I’ll use the rest of the pulled pork in a sort of enchilada this week. Love your recipes so much… they are foolproof and never fail! Great post! I’m new at meal prepping, it’s a life saver but I definitely need some inspiration, so thank you. I love meal prepping for at least two major meals at the start of the week and your ideas sound great. 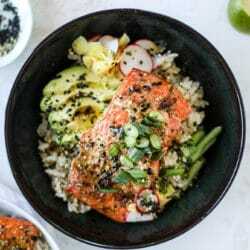 Loved your post on how to do it with your cookbook. this was great! I loved seeing other ways to use something, like the pesto…I had it in my head it had to be a sauce but using some to make into a dip? genius! I love this, I soooo need motivation to meal prep! We just moved so half my kitchen is still in boxes, but I can’t wait to start cooking from the pretty dish once were unpacked! It arrived during packing mayhem so I haven’t gotten to try anything yet 🙁 And I’m getting very sick of takeout lol. The tahini granola bars are happening first! Ahhhhh I would love this as a regular series. I find I am good at *sort* of meal prepping – but I work from home so I’d really just like to get better at it so cooking doesn’t eat into my writing time! Everything looks delicious, I’m definitely going to replicate this on Sunday! are the recipes for these posted?